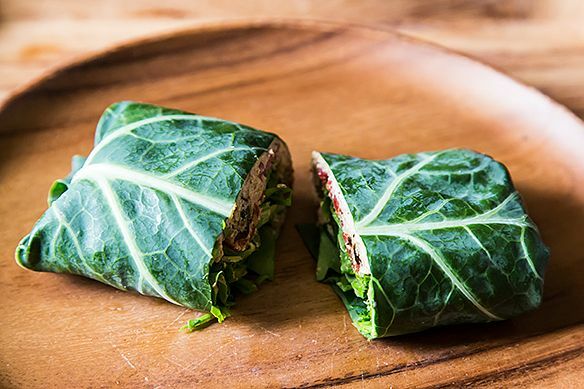 Today: Gena turns the traditional wrap on its head by putting the greens on the outside, with a recipe for Collard Wraps with Herbed Cashew Spread and Roast Peppers. When you're vegan, and your diet consists primarily of raw foods, it's not uncommon for your classmates, coworkers, friends, or family, to eye one of your dishes with incredulity. The "cashew cheese" that looks totally normal to you might look like white goo to somebody else; the sheet of nori stuffed with hummus, beets and spinach may strike someone who's used to conventional sushi as totally bizarre. The green smoothie you make so frequently that you could blend it up with your eyes closed may prompt in a houseguest a look of total shock. I have a lot of these moments. So it came as no great surprise to me that one day last spring, as I pulled a few collard leaves stuffed with cashew spread and raw veggies out of my backpack and began to munch on them in one of my lectures, a student friend of mine stared over with curiosity. "What," she asked, "is that?" "Oh, it's just a collard wrap," I explained, as though it was the most normal thing on earth. A moment later, when I realized that "collard wrap" probably hasn't made it into lexicons everywhere, I added "sometimes I like to wrap stuff up in greens, rather than a regular wrap." "I think you just changed my life," she replied. As it turns out, my friend's stare was neither revulsion nor general disbelief at my weirdness. I didn't know it at the time, but she has a gluten allergy, and had been struggling as a student to find suitable, packable food. 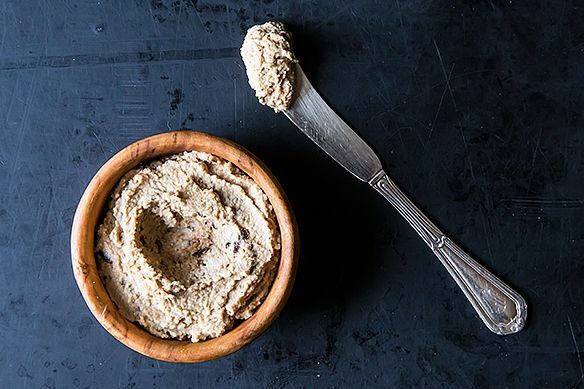 Most students rely on PB&J or some other sort of sandwich, so both those of us who are veggie-obsessed and those of us who have trouble with wheat or gluten are often left with an incentive to find some creative alternatives. Since that day, my friend has become obsessed with using greens as wrappers; I'm so glad that her life as a post-bacc student just got a little easier. 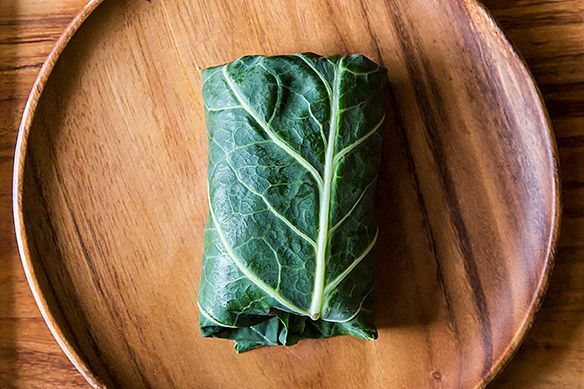 The first green wrap I learned to make was with collard leaves, but since then, my repertoire has expanded to include a number of other greens. Most all greens will do, but my general advice on selecting your wrapper is twofold: first, don't choose a leaf—like red lettuce, for example—that may be flimsy and likely to tear. Second, don't choose something like curly kale, which is indeed too curly to make a suitable wrap (lacinato kale actually works well, if you don't mind a smaller wrap). • Romaine leaves for more crunchy, fresh veggie "tacos"
• And for one of my favorite breakfasts, try Bibb lettuce leaves stuffed with almond butter and banana. I've also used Swiss chard leaves for this, and called it "breakfast sushi!" 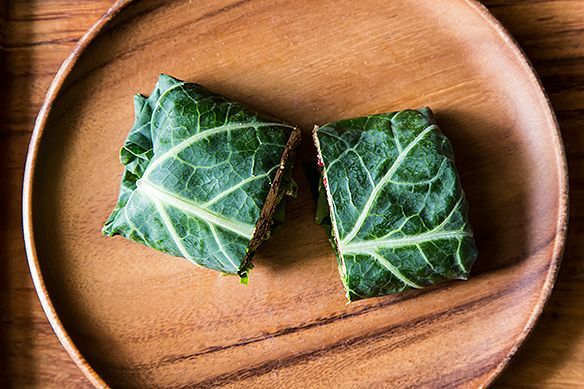 Like most new cooking techniques, working with collard leaves as wraps (or chard leaves: romaine, boston lettuce, and other greens are easier to handle) takes a little practice, so let's have a little "how-to," shall we? 1. Prep the Leaf: To turn a collard leaf into wrap material, you’ll first need to select a medium-sized, smooth leaf. Flip the leaf over so that the side with the prominent spine is facing up. Using a paring knife, gently shave down the spine of the leaf, starting near the bottom, where it begins to protrude most. Careful as you do this: you don’t want to cut so deep that you actually cut through the leaf! Just follow carefully along the spine, slicing away only the thick part of it. 3. Roll it Up: Fold the top and bottom flaps of the leaf inward. Then, fold one of the two long sides in, and start wrapping the leaf from that side to the other side. You should end up with something that looks like a burrito! For some how-to photos, you can check out this post. Slice the wrapped leaf along a diagonal, and you’re ready to go! One more thing: if this is your first stab at a green wrap, you might find the taste of raw greens to be a little powerful. No worries. You can either marinate the collard (or chard) leaves for a few hours beforehand, using a mix of 1 tbsp olive oil, 2 tbsp lemon juice, and a pinch of sea salt, then wipe the leaves off thoroughly before you wrap, or you can blanch them in boiling water for one minute and then submerge in cold water, just to soften them up. You’ll find that it takes a lot of the raw taste away! I’ve gotten used to using the greens just as they are, but I like how soft the marinade makes them. If you’re looking for a great first collard leaf recipe to try, consider this winning combination of collards, a cashew spread made with sun dried tomato and basil, roasted red peppers, and a spicy bite of arugula. I’ve served these wraps (or a variation of them) as appetizers or lunch fare at many a gathering, and they always earn rave reviews. What better way to showcase the versatility of greens? In this neck of the woods we call them Bunny Wrappits. I'm a fan of Asian-inspired chard wraps! Love your filling idea here. Oh, bliss! 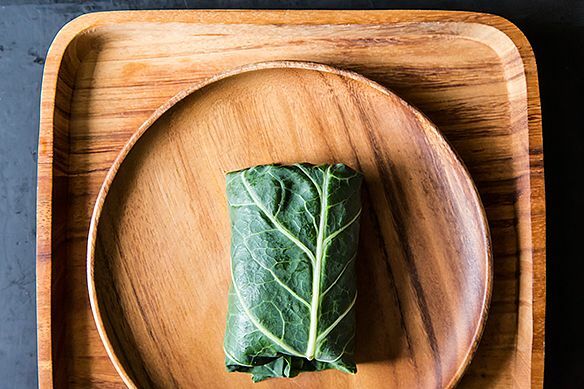 Love collard wraps! They are so delightful! Glad you like the post. I can't get enough of these kinds of wraps. While collards are always a favorite I like to use broccoli leaves too. I love that you whisper about vegan food in the middle of class.